TIPS: How to hang paintings, drawings, fine art prints and photographs. There's a world of difference to how artwork looks when hung by an expert - compared to when it's hung by somebody who lacks knowledge, skills and all the kit relevant to hanging pictures. Below are some basic tips for hang your pictures - whether they are paintings, drawings, prints or an object d'art. Work out what the composition of the wall is, Is it load-bearing or a dry wall? Is it made of concrete blocks, brick or timber and wallboard? Different types of wall dictate different kits for fixing and drilling. decide whether you are going to group around a (1) centre line (horizontal or vertical depending on the nature of the space for hanging) or are building up from (2) a bottom line (for horizontal hangs) or a vertical (eg x" from the vertical of a door frame). assess the weight of your artwork including frame BEFORE choosing hanging fixtures for the picture and the wall. You need to be very sure it isn't going to fall off the wall! a two point hang for larger pictures is much safer and more stable. The reverse of a framed artwork I purchased. D rings come in different sizes, different metals and can carry different weights. Be sure to check what sort of weight or type of picture they are suitable for before buying/screwing them into your picture. If you're hanging a heavy picture you really need to move on to a different type of hanging hardware. Mirror plates are typically used for hanging mirrors or framed artwork absolutely flat against the wall. The item is securely fixed to the wall and cannot re removed without unscrewing the screws. The reason why art society exhibitions and art competitions insist on frames which are not too narrow is that they often use mirror plates to fix artwork to walls. A mirror plate splits the wood. This is likely to happen if the frame is too narrow. The UK and USA vary in their preferences for heavy duty picture hanging wire - the UK likes brass and the USA likes steel. Braided wire is strands of wire which have been threaded together. Lots of single strands makes it easier to cut through. Stainless steel wire is the sort of wire used for hanging heavier pictures. To tie it off it needs to be whipped - which involves using a pair of pliers once the wire has been fixed to the artwork. Wire | Picture Hang Co. - details the weights different wires will hold. It's really important to check the load it will carry. Plus choose a wire appropriate to the load. The size of the wire is numbered and you should receive some guidance as to the weight it will hold. Below the brass wire on the left will carry 50lb and the vinyl coated steel wire on the right will carry 43lb (20kg). ​Plus don't forget that lbs are not the same as kg! Below is a video which provides instructions on How to Properly Knot Picture Frame Wire. 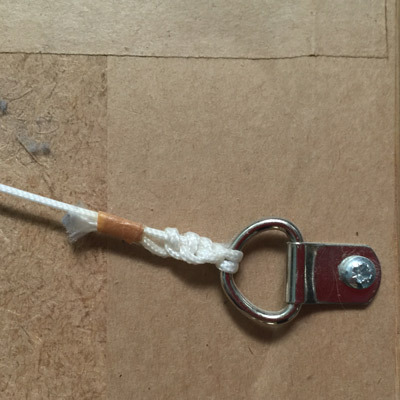 The same technique applies to picture cord except you need to fix it so it will hold. it comes in different widths with different breaking strengths. it's a lot easier to tie off than wire. Quality picture hanging cord should be made of material which does not stretch. This is usually polyester twine.. Unfortunately not all is good quality e.g. nylon cord stretches a lot more than polyester. I recommend you buy the sort of picture cord used by professional suppliers. Finally, a cord is only as secure as the method used to secure the cord to the picture so it won't come undone. Lots of people are puzzled as to the best method to use. The recommended approach when using picture cord is to make sure it is "whipped" at the ends to ensure they don't untie or unravel. 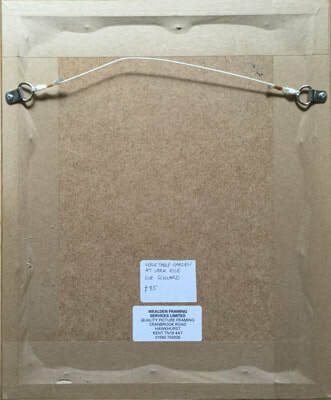 This supplier demonstrates the different widths of picture hanging cord you can get - for different weights of pictures. Don't forget it you are hanging a lot of pictures you will get through a lot of cord. I can highly recommend the "picture cord in a box with a hole" approach. The one I use comes like this and I NEVER have problems with knocking over the cord inadvertently - only to find it runs away unravelling as it goes! A small artwork framed using professional picture cord and D rings as hanging hardware. Note how (1) the professional framer has used single strand of picture cord and then knotted and and whipped the ends (2) the back of the frame uses brown tape to seal the backboard to the frame. what sort of hanging hardware is best for the job - after taking into account both weight of the artwork and the type of wall. How heavy is your picture? Heavy pictures require tackle that can carry the weight and reinforcement. Is your hanging tackle adequate for the weight of the picture? Should you use a chain rather than heavy duty picture wire? What sort of wall do you have? Walls can be very different - even in one room. The surface can also be different on one wall in older houses where the property has been refurbished. Is your wall a dry wall (constructed from a timber frame and plaster/wall board) or is a load bearing wall - built from brick or breeze blocks? Will it provide the stability required for a heavy picture? What's behind the plasterboard - thin air or concrete blocks? Can you find the studs on a plasterboard wall for a really secure hanging? Does it need special kit for the wall? 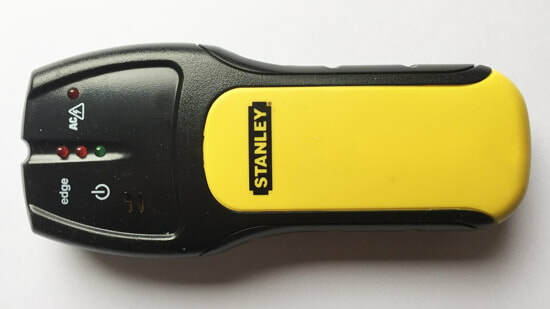 For example a professional stud finder which can also locate wiring and plumbing? Do you need special equipment to drill? Drilling into masonry or concrete requires very bit different drill bits compared to drilling through plaster/wall board. 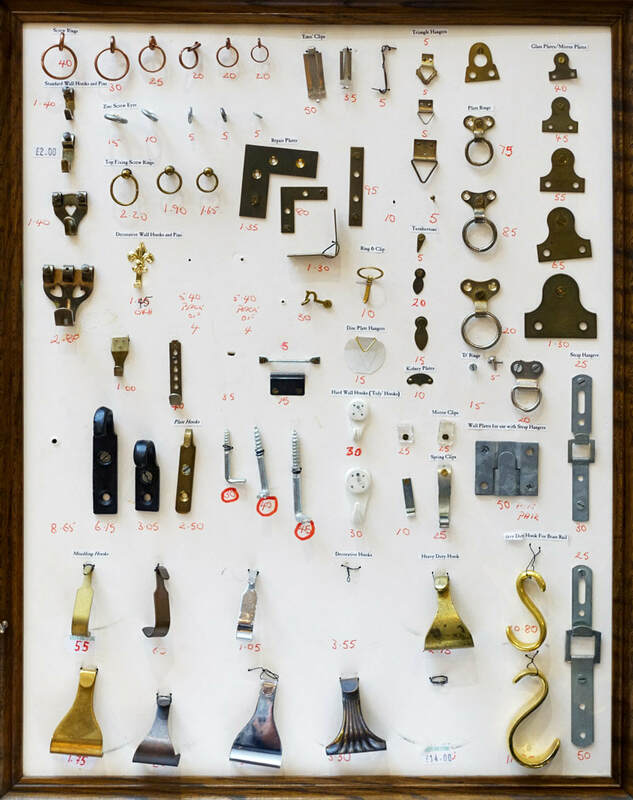 What sort of hanging hardware do you need? The bigger and heavier the picture, the bigger and heavier the hanging hardware! How many people do you need to hang your picture? If it's really big and heavy this is NOT a one person job! These articles provide more in-depth guidance on kits and processes and things you need to check before hanging any item on a wall. ​This is the sort of wall fixing I use for hanging heavier pictures on my solid brick walls. This one will hold up to 20kg. 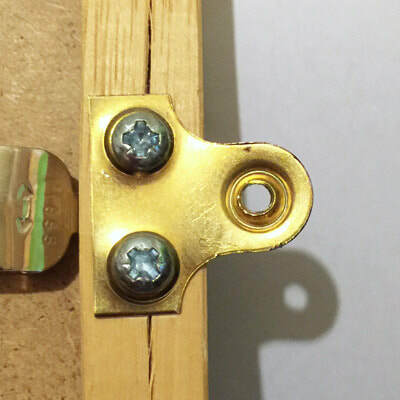 The the brass strap hangers with three holes are drilled into the wood frame and attached using the 16mm screws. This helps distribute the weight. The nickel finish hangers are then attached to the wall using the 2 x 40mm steel screws and rawl / wall plugs. However this is the #1 best selling stud finder on Amazon UK. ​How to hang pictures | Royal Academy - Dan Cowap (Head of Art Handling and Galleries Management at the RA) explains a few key points to bear in mind when hanging paintings and other framed works. How To Hang Your Artwork and Not Screw It Up | Apartment Therapy - explains a great tip - always hang your artwork at 57" on center - for making picture hanging a simple, gratifying task. Finally, get out a spirit level and, if you like, a ruler, to make sure that you have everything straight.